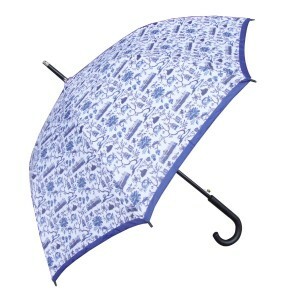 Double layered luxury Hong Kong toile umbrella in Faux’s iconic Hong Kong Toile repeat pattern designed by Mariko Jesse. Size: 87cm Height This beautiful artist designed double layered quality Umbrella will add so much style to your umbrella collection The unique toile design, classic yet contemporary is timeless in every way and these elegant ceramics are a perfect addition to your home décor. Exquisitely packaged, the toile series make for perfect gifts such as weddings and birthday presents. They are also great for festive celebrations such as Christmas, New Year and dinner parties. 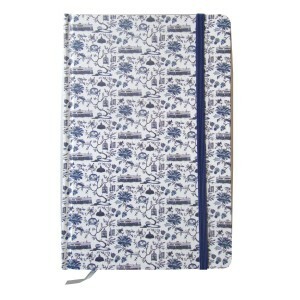 Available in classic blue and white. A red fine bone china 10.5-inch dinner plates in Faux’s iconic Hong Kong Toile repeat pattern designed by Mariko Jesse. These beautiful artist designed fine bone china 10.5” inch dinner plates will add so much style to your table setting. The unique toile design, classic yet contemporary is timeless in every way and these elegant ceramics are a perfect addition to your home décor. Exquisitely packaged, the toile series make for perfect gifts such as weddings and birthday presents. They are also great for festive celebrations such as Christmas, New Year and dinner parties. Available in classic blue and white china exportware and red and white. A red gift box set fine bone china cup and saucer in Faux’s iconic Hong Kong Toile repeat pattern designed by Mariko Jesse. This beautiful artist designed fine bone china Cup and Saucer set will add so much style to your crockery collection. The unique toile design, classic yet contemporary is timeless in every way and these elegant ceramics are a perfect addition to your home décor. Exquisitely packaged, the toile series make for perfect gifts such as weddings and birthday presents. They are also great for festive celebrations such as Christmas, New Year and dinner parties. Available in classic blue and white china exportware and red and white. A 12-piece gift boxed fine bone china blue Chinese dining set for 2 in Faux’s iconic Hong Kong Toile repeat pattern designed by Mariko Jesse. 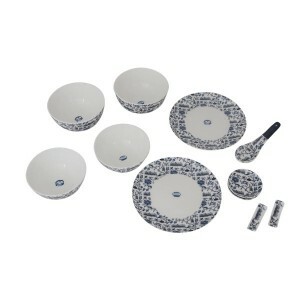 The set includes 2 side plates, 2 Soup bowls, 2 rice bowls, 2 soy sauce dishes and 2 chopstick holders. This beautiful artist designed fine bone china 12-piece chinese dining set for 2 will add so much style to your table setting. The unique toile design, classic yet contemporary is timeless in every way and these elegant ceramics are a perfect addition to your home décor. Exquisitely packaged, the toile series make for perfect gifts such as weddings and birthday presents. They are also great for festive celebrations such as Christmas, New Year and dinner parties. Available in classic blue and white china exportware and red and white. A set of 6 fine linen blue tea towels in Faux’s iconic Hong Kong Toile repeat pattern designed by Mariko Jesse. Size: 48 x 70 cm This beautiful artist designed linen Tea Towels are highly absorbent and make the perfect gifts for family and friends. The unique toile design, classic yet contemporary is timeless in every way and are a perfect addition to your home décor. Exquisitely packaged, the toile series make for perfect gifts such as weddings and birthday presents. They are also great for festive celebrations such as Christmas, New Year and dinner parties. Available in classic blue and white and red and white. A set of 6 fine linen blue napkins in Faux’s iconic Hong Kong Toile repeat pattern designed by Mariko Jesse. Size: 55 x 50cm This beautiful artist designed linen Napkins will add so much style to your table setting. The unique toile design, classic yet contemporary is timeless in every way and these elegant napkins are a perfect addition to your home décor. Exquisitely packaged, the toile series make for perfect gifts such as weddings and birthday presents. They are also great for festive celebrations such as Christmas, New Year and dinner parties. Available in classic blue and white and red and white.